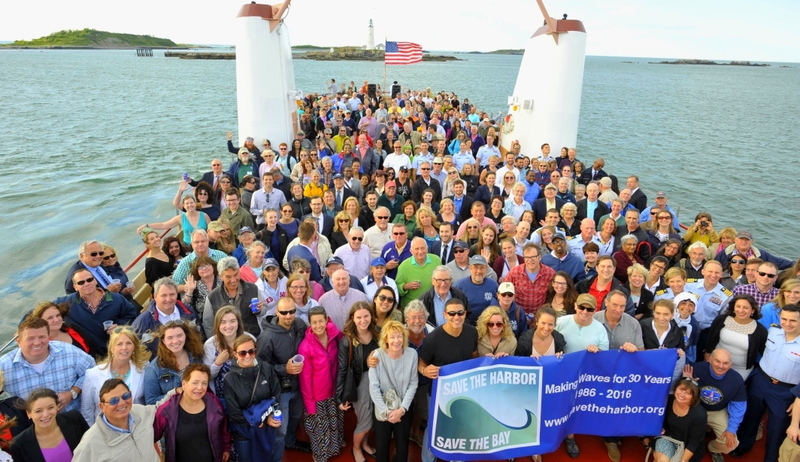 I would like to thank you for helping Save the Harbor “share the harbor” like never before. 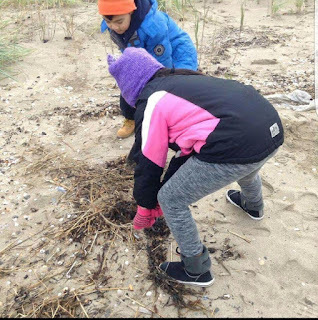 With your support, this year our free Youth Environmental Education Programs connected 30,375 youth and teens from 42 communities to Boston Harbor and the Boston Harbor Islands State and National Park. We would love your support again this year. Your contribution of $25, $50, $100 or whatever you can afford to give will make a real difference. Make a donation here. In the past three years these free programs have doubled in size and impact, helping to make Save the Harbor the Boston Harbor Connection for the region’s kids and families, serving more than 160,000 young people since 2002. Together we have created a new generation of environmental stewards who understand the value of Boston’s spectacular harbor, beaches and islands to them and their communities. 2016 was also a terrific year for our Better Beaches Program partnership with the Department of Conservation and Recreation, awarding more than $200,000 in small grants to 43 groups in 9 beachfront communities and waterfront neighborhoods. These groups in turn leveraged our funds with nearly $500,000 in cash and in-kind support from local government and businesses and more than 8,800 volunteer hours to support over 100 free concerts, , beach festivals, sand raking exhibitions and sand sculpting competitions from Nahant to Nantasket. We also won important victories in the policy arena, though recent developments put many of the gains we have made at serious risk. On the bright side, this summer Secretary of Energy and Environmental Affairs Matt Beaton asked Save the Harbor/Save the Bay to quarterback an initiative to create a consensus on next steps to finally resolve the ongoing pollution problems that still close beaches in Lynn, Swampscott and Dorchester. Working together with state and local officials, our Beaches Science Advisory Committee will issue a report next summer which will pave the way for capital investment by the Commonwealth to help these communities. In June, the Metropolitan Beaches Commission which we lead and manage for the Legislature, held a hearing at the State House. At that hearing the Commission called on the Baker Administration to jumpstart their efforts to develop a regional water transportation plan to connect the region’s coastal communities with each other and with the Boston Harbor Islands National and State Park, which they have agreed to do. However, despite these successes, there are real causes for concern. Several weeks ago, in response to projected declining tax revenue forecasts, the press reported that the Baker/Polito Administration was considering $294 million in budget cuts that we believe would put many of the gains we have made in recent years at risk. Since then, increased tax revenues have resulted in a postponement of the decision to cut these programs. However, we are still concerned about the possibility of revenue declines and imposition of these cuts on DCR, which is considering cutting funds for full time and seasonal staff, maintenance and free events and programs on the region's public beaches in 2017. The Commonwealth's 13 public beaches are critical civic, economic and recreational assets for the region's low income and underserved youth and families. Rather than further cuts, we believe that we should be making additional modest investments to protect the nearly $5 billion we have already invested in the Boston Harbor cleanup. We are proud of our role as the region’s leading voice for clean water and continued public investment in Boston Harbor, our public beaches, and beachfront communities and waterfront neighborhoods from Nahant to Nantasket. Working together we have transformed Boston Harbor from a liability into a source of opportunity and pride for Bostonians and the region’s residents. I know that you understand the value of Boston Harbor, the islands and our public beaches to all the region’s residents, especially underserved young people and low income families. I also know that we can count on you. Your contribution of $25, $50, $100 or whatever you can afford to give will make a real difference as we continue our work to restore protect these spectacular urban natural resources and share them with the public for everyone to enjoy. On behalf of the Board of Directors and the staff at Save the Harbor, I want to thank you for your support and wish you a very happy holiday season. Hey guys, it feels good to be back. Ever since the school year started, I've been waking up around 11 am or 12 pm on Saturdays, therefore it was kind of hard to wake up at 7 to be at the World Trade Centre at 9. The last time I went to Spectacle Island was in August, it was really hot and now that it is October it got really cold. I remember that I used to stay in one place in order to stay cool, but now I was moving around because I was trying to be warm. Although it was cold, people still had fun and enjoyed the island. I remember over the summer seeing the boat full of kids and a very few adults, but now there were more adults than kids. After meeting up with the SHSB staff and all the people that were going with us to the island, I noticed the smiles on the faces on the kids and especially the adults. The adults asked more questions than the kids, the kids were more excited about the marbles. When we got to the island, the first thing people asked was about the marbles, "where can I find them? ", "how big are they? ", "can you give me any hints? ", were the commons questions people asked me. I never thought that people were going to pay more attention to the marbles than to the things in the island. There was a time when about 20 people were looking for the marbles on one side of the beach. Everyone that was looking for the marbles, looked everywhere under the rocks, they were making holes in the sand, going into the bushes, etc. After the people found all the marbles they wanted to walk to the top of the island. I've never been there so it was about to be my first time as well, I was somehow excited about it because I knew that the view was going to be amazing and it sure was. I had a great Saturday morning/afternoon. Seeing some old faces and the island that I enjoyoed the most out of the two island that I went to over the summer was the best thing that could have happened to me on a Saturday. Raquel Cunha of Dorchester wins the “Simply Marble-ous” Treasure Hunt! 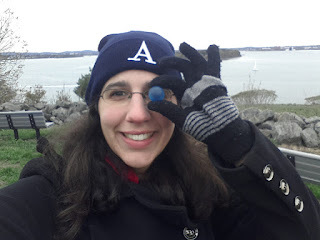 In November, Save the Harbor/Save the Bay selected the JetBlue ticket winner in our “Simply Marble-ous” Treasure Hunt, Raquel Cunha of Dorchester!! She found her blue marble on Spectacle Island and throughly enjoyed the day's activities. On top of the marble treasure hunt, Raquel loved hearing stories by Nora Dooley, also known as Mary Read the Pirate. "I believe the initiative to promote awareness and educate people about [Boston's] Harbor islands and their preservation are very important and will allow for future generations to enjoy the area as much as I did," said Raquel. Raquel can use her round-trip JetBlue ticket to go to ANY of JetBlue’s domestic locations leaving from Boston Logan Airport! Raquel plans on using her round trip going to either San Diego or Miami. Either way she will enjoy a beautiful beachy destination. While this year’s contest is over, Save the Harbor has already begun to plan for next year’s ‘Simply Marble-ous’ Treasure Hunt, which begins on Memorial Day weekend, so stay tuned! The last time I was here it was a bright summer day where I was comfortably in my flip flops waiting to jump right into the water. Last time I could remember it was about 90 degrees and nothing felt better than being in my blue shirt and my comfortable shorts. All I did was complain about the heat now it's October and it's freezing! Oh man how I wish it was that warm again. It was a pleasure to be with my co-workers once again but this time it was a completely different day. Instead of doing our normal routine we took groups on wonderful trails to see the beautiful views and to enjoy nature. We also had the pleasure of showing around a wonderful group from the Boys and Girls Club who were taking pictures of items they had on their list. They had so much to take pictures of from the landscape to the rocks, the sea glass, just everything. We also had a marble hunt and the kids just went.... M A R B L E S, hahaha. Get it because they were looking for marbles. HAHAHA!! I can not wait to be back in the summer and being able to connect with families all over again. The view was breathtaking I could definitely see that beauty in the city skyline. Everything about this day went by smoothly and everyone was pleased which warmed my heart up little by little before we got off the boat. My first day back at Spectacle Island since the summer was filled with excitement, new discoveries, and fun. I learned many new things and met new and interesting people while also enjoying some perks of the island I have never gotten to experience. Spectacle Island has always been very enjoyable, and Saturday was not any different. The day started with our staff meeting up at the World Trade Center, near the spot where the boat takes off. It was nice to catch up with friends from the summer, and I really enjoyed being able to talk to my co-workers for the first time in months. Once we got onto the boat it was interesting to see how much the boat and the Boston Harbor have changed in the last couple of months. As we got closer to Spectacle Island, I could notice how much greener the island has gotten. During the summer Boston was in a drought and Spectacle Island was suffering. This month Boston received a lot of rain and now Spectacle Island is looking as beautiful as ever. Once we arrived to the island, we planted blue marbles all around the island as part of our Jet Blue scavenger hunt. If a visitor finds a blue marble they can enter a lottery, the winner of this lottery receives two free Jet Blue tickets to anywhere in America. Giving people the opportunity to win this amazing prize was truly wonderful, and it was incredible to see people's reaction after finding a marble. We also took some groups out on walks around the island, and even though it was freezing we enjoyed the view on the island. After this the day came to a close, and we all said our goodbyes to the amazing guests who came out to visit the island with us. As I was walking along the beach, I saw these birds sitting on the rocks, and decided to take a picture of this interesting scene. Last time I was on Spectacle Island it was in August and its was a hot beautiful day, I remember looking for shade to stay cool due to the heat. Last week was my first time at Spectacle since the summer and it was really cold. It felt like winter and Spectacle is surrounded by water, which made it even colder. The cold did not stop us from having fun. We got on the boat around 9:30 and we had a lot of people on board. Some people told me this was there first time going to Spectacle Island and they were really excited. When we got off the boat, people separated and went on their own to explore the island. Some went hiking on the top of the island and the others were busy looking for the blue marbles. If you find the blue marble , you take a picture and it enters you in a raffle to win 2 Jet Blue tickets. Many people were really excited and took the challenge of finding the marble. After the marble hunting, we all went for a hike on the top of the island, and it was really long walk. We stopped a lot to take pictures of the amazing view the island displays. You can see the whole city and its beautiful skyline from the top of the island. After we got back to the boat, we took one big staff picture and it reminded me of how amazing summer was and I'm glad I had the opportunity to work with such amazing people. It’s Edward- it has been a while since I have written a blog post about our wonderful staff events with Save the Harbor Save the Bay. Today on October 29th, 2016 staff members, including me, were invited back for an event with Save the Harbor Save the Bay. We were all invited for a trip back to one of the well-known island called Spectacle, known for all its historical impacts. Before we got on the boat to Spectacle Island, me and a couple of the Save the Harbor Save the Bay members stayed behind to help people find the boat we were getting on. On the boat you can see a view of the Boston islands along the way. Every island along the way has its own history to be told. The children and their parents were enjoying the boat ride to Spectacle Island. They learned new things they never knew about the islands. Others enjoyed the ride to Spectacle Island because it reminded them of how much they really enjoyed Boston. When we got to the island the families and the children were searching all over the place for a blue marble that would enter you in a raffle to earn a ticket for a trip. Any blue marble the kids would find was only counted as one chance. The children would go to hear pirate stories from the pirate her self named Norah. She is an incredible pirate and an incredible story teller who would catch anybody’s attention. We were separated in groups, my group started off along the beach shore looking for blue marbles and viewing sea glass while taking pictures as well. The sea glass my group collected was soft and one of a kind. I got a chance to walk around Spectacle Island and was able to view the whole island and the view of other islands. The children liked looking for four-leafed clovers that represented something we all wish for called good luck. The children would ask questions on how the community from Boston and others would usually use the islands. A few seconds into the question we answered by saying people usually get in the water or go fishing, and others do fun activities. At the end of the day people wanted to know about any upcoming events that could bring them back to the island. Some just couldn’t wait for next summer to come along. This was the first time I got invited to a Save the Harbor Save the Bay event where it was really cold out on the island and we could barely see any birds on the island. When we got on the boat I was having so much fun on the island I didn’t want the boat to arrive back on the dock of the World Trade Center. This trip back to Spectacle Island is going to be as memorable as the summer trip was. The last time I took a trip out to Spectacle island was in the summer with All Access. But going on the cruise this weekend it had a different feel to it. As always I had an amazing seeing the familiar faces at Save the Harbor. But seeing all of the families that came out to the island is probably what made my day the most. Although it was a chilly day, the amount of people that came out for a day on the island was remarkable. We had people who have never been to Spectacle before, and people coming from different countries to study abroad, just to spend a day with us. I couldn't have asked for a better way to spend my Saturday afternoon. The last time I was at Spectacle, it was about 80 degrees and nearly 350 children running around with footballs and water bottles. Now, it was about 30 degrees cooler and not as many children. If its one thing that didn't change were the smiles on everyone's faces. From people searching for marbles or just simply taking a walk to the top of the island. I had an amazing time, and more importantly, everyone did as well. It was actually my first time walking all the way to the top of the island and it was pretty fun. The grass is even greener! Took a look over and I think I could see my house from here! I had an amazing time sharing my experiences and memories with everyone that came out on Saturday. See you next time, Preston.